The British team have their best chance ever of taking home Winter Olypmic medals at the Sochi games. No one would dispute that Britain is better at summer sports than winter ones. The figures speak for themselves: UK team failed to bring home a single medal in seven of their 21 Winter Olympics. At Vancouver 2010, British athletes managed just one, when Amy Williams struck gold in the skeleton. Moreover, only Russians who are well versed in the various World Cups played out in winter are likely to know the names of the British athletes, even those coming to compete in Sochi. This is against a background of Britain’s hugely successful performance in the 2012 Summer Games on home territory, where the team won 29 golds. It is also true that the winter team currently has no stars with the profile of Andy Murray, Mo Farah, Chris Hoy or Bradley Wiggins. The Sochi Olympics are a chance to put that right. Elise Christie, for example, in short-track speedskating, is very strong over 1,000m while Lizzie Yarnold and Shelley Rudman have big medal chances in the women’s skeleton. Rudman, now 32, is a former track and field athlete who was so impressed by Alex Coomber’s bronze in the Salt Lake City Games in 2002 that she switched to skeleton racing herself. Of course, the standard of competition on the starting lines could upset all pre-Olympic expectations but, even if none of the above wins, Britain has a good chance of adding to its medal haul. Scotland and curling come to mind first. Heaven only knows why the Scots are so enamoured of this particular sport but their team does better year after year, and the competition among players for places might be envied even by Canada, a country with more than 1,000 curling rinks. Scotland’s women won the 2013 World Championship in Latvia and the men have been among the medal winners at three recent international competitions, with two silvers and a bronze. There will be competition from Sweden and Canada and, in the women’s event, even from Russia, but Britain’s chances of a medal have never been better. Britain’s 2012-13 ice dance champions, Penny Coombes and Nick Buckland, who are both 24, could also be in with the chance of a medal, according to Russian bookmakers. Their overall bronze at the European Championship may prove misleading, however; the medals will most probably go to Russia, Canada, the US or France. Britain is not even competing in the most eagerly awaited contest of the Games – the ice hockey. Sadly, this sport, which is so popular in Russia, is not a favourite with the British public. Will there be much demand for it among British television viewers? Probably not. It takes place in the middle of the English Premier League season when Russian owner Roman Abramovich’s Chelsea will once again be trying to top the table under second-time-around manager, José Mourinho. This all goes to show that the Winter Olympics could be lost on the British viewing public all together. Big wins generate interest and there have been none so far. In this respect, the Sochi Winter Olympics could be a turning point. Just imagine: gold in the skeleton, two silvers in curling and two bronzes in the skeleton and ice dancing. Just five medals. It would be Team GB’s biggest achievement ever at the Winter Olympics. Another outcome is also possible for UK team – winning only one or two medals or even none at all. In that case, it will be very difficult to win young people over to winter sports. So, there is a mighty mission ahead for UK team. Will it be mission accomplished? We don’t have long to wait until we find out. 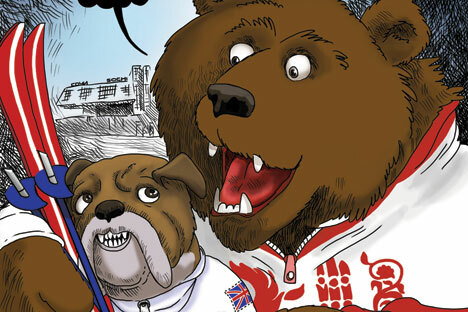 Find out more about Sochi 2014 in our Special section.